Madrid’s Mad Cool Festival rocked out a colossal list of superstars stacked up to be a killer event during their last festival. They booked everyone from Pearl Jam, Tame Impala, Nine Inch Nails, Depeche Mode, Jack White, Arctic Monkeys, Post Malone, Queens Of The Stone Age, Dua Lipa, Massive Attack, to Fleet Foxes. What does a European festival like Mad Cool do to one-up their own festival? By unleashing an even grander and bolder lineup for their 2019 outing. This week, Spain’s popular festival has just unleashed the first round of their 2019 lineup and it features some A-list artists, According to Consequence of Sound, the new lineup includes The Cure, The National, Bon Iver, Vampire Weekend, and Smashing Pumpkins as some of the headliners. The newly added lineup also sees Noel Gallagher’s High Flying Birds, The 1975, Greta Van Fleet, The Hives, Tash Sultana, Mogwai, Kaytranada, Jon Hopkins, Wolfmother, Teenage Fanclub, Bonobo, Jorja Smith, and The Twilight Sad all set to take the Madrid stage next year. The National, which is set to headline the festival, has had a busy 2018 year by supporting their seventh studio album, Sleep Well Beast. They have been on the road touring across U.S. One of their performances included a set at Austin City Limits Festival where they were joined by Chvrches’s Lauren Mayberry. Bon Iver has performed in a few festivals already this year including Outside Lands, Pitchfork Music Festival Paris, Sasquatch! Music Festival and Bonnaroo to name a few. 2019 is not going to be any different as it sees a few more festival appearances in Bon Iver’s future. He is set to perform sets at Nos Alive, Northside Festival and of course Mad Cool in Madrid. 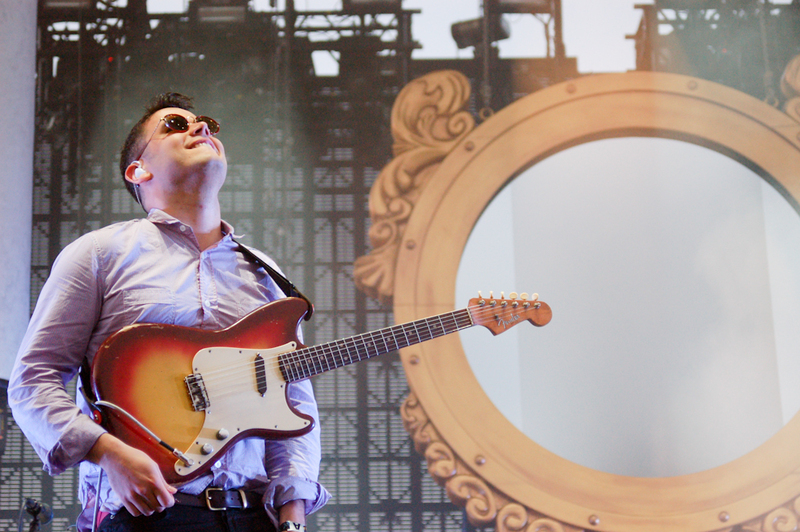 Vampire Weekend signed with a new label, Sony, late this summer and plans for a new album is already in the works for the New York-based rock band. Their festival schedule for 2019 not only includes Mad Cool but also Hangout Music Festival. Tickets for the festival will go on a pre-order sale starting soon. There a few options for those who wish to attend including one-day passes to three-day passes. There is an option for VIP passes that will give ticketholders all access to VIP areas, a chance to relax near the bar and restaurant areas for low prices, the ability to watch all performances live screen, access to the Mad Cool Welcome Party and more. To get more information on Mad Cool tickets, go to the official website. 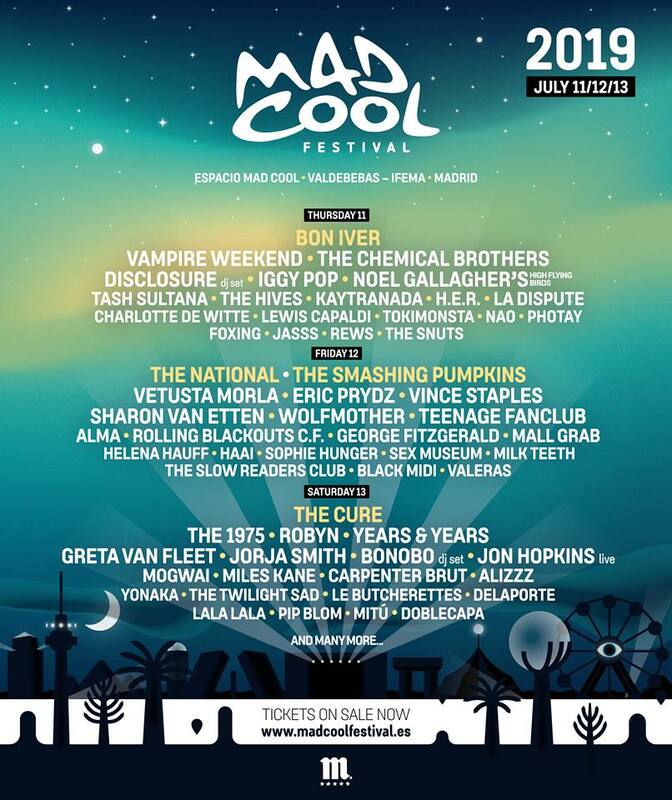 The Mad Cool Festival is set to take over Madrid the weekend of July 11th through the 13th. 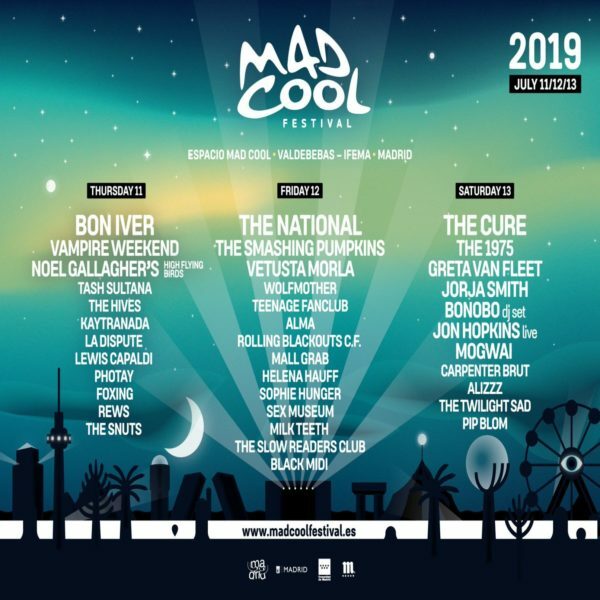 UPDATE (12/20): Mad Cool has added to its already-strong 2019 lineup with a new batch of artists. Included in this round of announcements are The Chemical Brothers, Iggy Pop, Robyn, Years & Years, Disclosure, Eric Prydz, Sharon Van Etten, Miles Kane and others.